Our water drilling team is amazing! Here is their first completed well at Bokolimba. This has been an incredible trip and we have so much to share when we return home about this place and our brothers and sisters in the Democratic Republic of the Congo. We are headed home! See everyone next week. Today broke just as every other day has for us here in Mbandaka; music playing and babies crying at 5:45 AM. But, something was different this morning. There was a feeling of anticipation in the air. Not just for us, but for the drill team as well. Our now quite experienced team of drillers was at the well site early this morning to continue cleaning the well. By 11:00 AM the well water being removed by the bailing tool was clear. The chatter picked up and a spring appeared to be in everyone’s step when the D4W team and Carmen returned to the well site after a planning meeting with Rev. Bonanga and his staff. PVC had been cut and laid out for the water line from the pump up to the surface handle. The inner casing that holds the pump in place was in line on the grass, and the team was eager to weld the joints up and get this show on the road. After one more lesson from Jacques, the welds were made and the pump lowered into the bore hole. Rev. 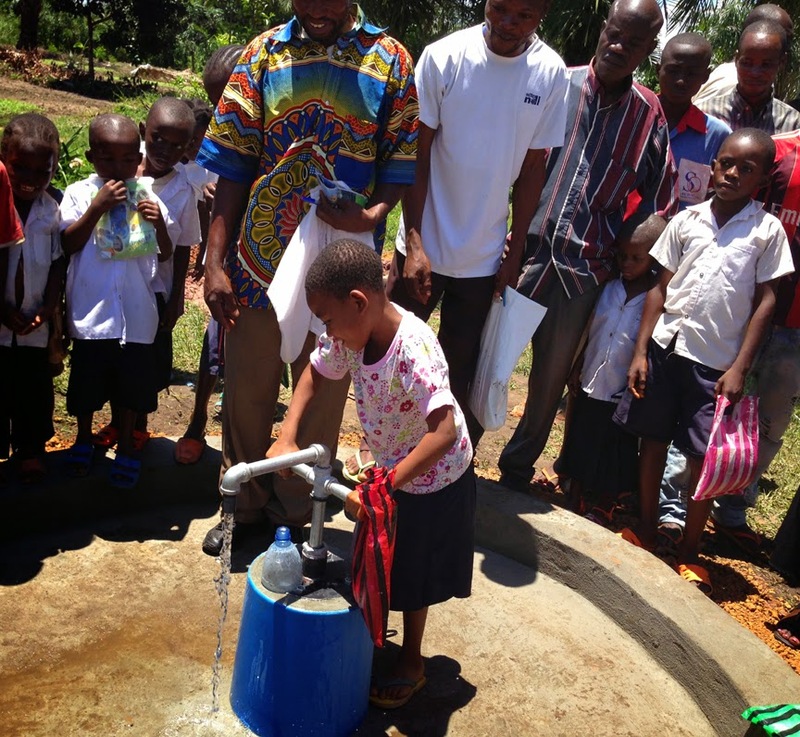 Bonanga was invited to test the pump to ensure everything was working properly before cement work began. After two short strokes a small stream of pure clear water splashed out of the pump nozzle and onto the ground to a very loud cheer from the D4W team, the drill team and the community members who just happened to be there at that moment. We have water!!!!!! A formal dedication will be held tomorrow (Friday) and there is still a bit of work to complete. Our drill team wasted no time in attacking the remaining tasks. The outline of the apron was drawn on the ground and shovels quickly turned small amounts of dirt to create the pattern for bricks and mortar. Our mason on the drill team began barking orders and several other team members moved into position bringing small rock and sand to mix with the cement. Here is the sight which is quite different than the way we mix concrete in the U.S.: Cement mix is poured out in a pile on the hard pack earth that has been swept free of most of the loose dirt. Then sand is added on top. One person gently mixes these together and spreads them out in a circle about four feet across. A wheelbarrow then appears and dumps small brownish-red rocks (as opposed to gravel) on the pile. This is all mixed together and then water is poured on top. More mixing and then you have exactly what you expect to see… good quality concrete. The team worked well into a rainstorm with four of the guys holding a tarp over the concrete work as our mason finished his job. It is truly a thing of beauty. This is what we have wanted to see since we arrived in Africa. Tomorrow we will dedicate this well and celebrate with the local community as they have a source of clean clear water at their church/school. Oh, I almost forgot to say that the cistern is full at the annex so Steve and I got to take real showers today!!! (Janet, Gwen, Lisa) This journey started for me a year and a half ago when my heart broke for those around the world that did not have access to clean water. One of the first things the guys at Water4 said to me when I met them was “so God has broken your heart too”. This has been a theme from the beginning, even a bible study that I did during this time. I never expected my heart to break any more. I was wrong! Tuesday we visited a Nutrition Center in Mbandaka, a place for malnourished children and their families to get support. Yes, we have seen the pictures of little children with extended stomachs. I can share with you that this is NOTHING compared to seeing these children in person. I was overcome with heartache for these helpless babies. The first thing that grabbed my attention was a little girl with the sweetest face. She cocked her head to the side as she looked at me. When I smiled at her she timidly smiled back. Those cute chubby cheeks – you don’t realize they are a sign of malnutrition. She looked like she was 2 years old. She was 5. Her brother was at the table next to her. He had the body of a little old man, extended stomach, thin arms and legs. He was not much taller than his sister, looked about 4 years old. He was 8. I didn’t think my heart could take it. But I sat and prayed over this place, gave it to God and asked his blessing for these delicate children and that He take this pain in my heart and turn it into something more. 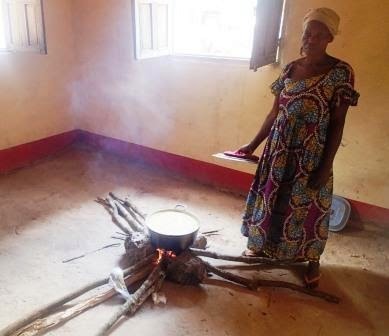 As we walked into the first room Lisa was surprised to see that there was a fire going on the dirt floor with a pot of porridge cooking over the open flame. Yes, the room has open air windows but there was still quite a bit of smoke. The fire was constructed with long pieces of wood arranged so that the ends were burning. The pot of porridge sat on top of two rocks, where in between the ends of the burning wood were flaming. The porridge consisted of soy bean flour, milk, sugar, and caterpillars. The caterpillars provide good nutrients for the children. They are ground down and added to the porridge. The children are also given any medicine they need. It was sitting on the table next to the porridge as it was being served. 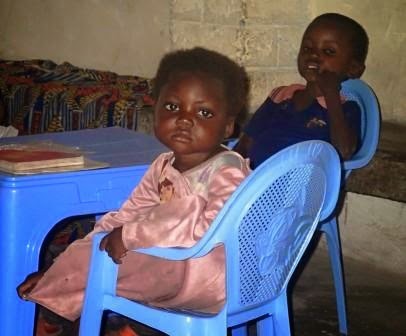 Twenty five children with their mothers or family come to this center every 3 months. Some of them come from villages far, far away. They come each day to get food, medicine, and education. The mothers/grandmothers/family members get instruction on how to properly feed their children at home. As in most places instructions are not in writing due to illiteracy. In this center there are large murals on the walls depicted fruits, vegetables, and fish. Rosette, the head of the center, explained that a lot of mothers feed their children protein thinking that is what is best but they need to learn to provide a well rounded diet including fruit and vegetables for their families. One grandmother was with her grandchild. This baby was 4 years old but was the size of an 8 month old. When it came time to eat the porridge he didn’t want to eat it. Listless and expressionless is a good description of these children. Good news is that if they come consistently each day improvement is seen in 2 weeks. These children can be saved. These families can be helped. But patience is needed. It takes time to encourage the mothers and fathers to allow their children to attend the center. As you can imagine, it is difficult to admit you can’t feed your children. The parents need jobs to support their families. This is just another way clean water can help. Mothers can get jobs, children can attend school because they aren’t sick. As mothers see their children become healthy they realize that clean water DOES make a difference and that proper nutrition IS important. Often while here, we compare what we see to what we know at home. Yes, there are children in Oklahoma City that need our help. There are families that need jobs and support just like these families do. The difference is that there is no government safety net here. Here you are on your own and children die. 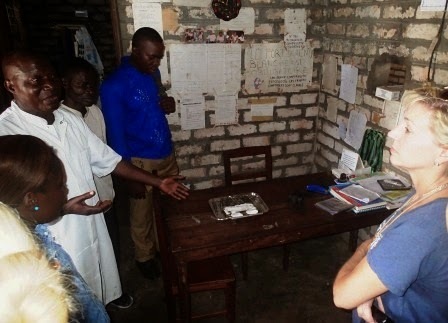 The nutrition center that we visited is another ministry of the CDCC – Community of Disciples of Christ of the Congo. The young lady that runs the center, Rosette, left her young family behind and went to the Philippines for 3 months of training so she could open and operate the center. She is a local church minister’s wife and hers is a volunteer position. The other two ladies who work there are also volunteers. Rosette saw a need and was called to minister to these families and children. Next door to the nutrition center is a medical clinic, also run by the CDCC. Even though the doctor there is trained in treating eye diseases and performs cataract surgeries, he also treats other patients. The clinic has two rooms – one that is the waiting room, as well as has four beds for patients and the other room is the operating room as well as the clinic’s office. He uses instruments that are a couple of decades old. There were two ladies waiting to see the doctor the morning we were there. At home we take so many services and conveniences for granted. We realize that here, if it weren’t for the CDCC and individuals such as Rosette, there would be nowhere for these families to turn for help. 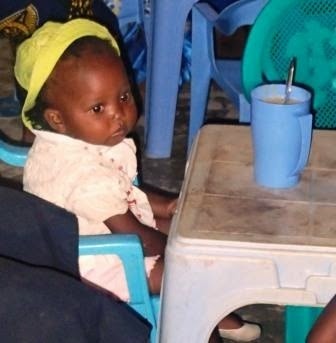 Even more children would die of malnutrition and the people in the community with desperate needs would go unserved. (Frank Gresh) You have probably read in several of our posts we talk about canoes. We throw the term around a lot, but as you read this in the US, you probably have no context for what it is we’re talking about. So, canoe can mean many things here in the Congo. I have seen canoes as short as five or six feet, and some as long 40 or 50 feet. Some are sleek and ride close to the water line and move along close to the shore pretty quickly. The larger ones are probably big enough for an Atlantic crossing, well not really, but the can carry lots of people and stuff wherever it needs to go along the river. Now, the really neat thing we have seen is when one canoe is good, more is better. As we mentioned elsewhere we took a trip on the hospital boat; which is a thing of beauty! They took three long canoes (40 footers), bound them together, and built a small two room building on top of that platform. The canoe supermarkets are pretty cool too. We noticed our first one a week ago. These are floating barges built from canoes of all sizes. The canoes are strapped together and thatched tent-like structures built on top of a platform. They sail these down the river to a canoe marketplace. It can take up to six months for the largest canoes to be built; smaller ones take less time. They are all built way up river, where the forest is lush with trees that are best suited for canoe construction. How do they build them you ask? They are each built from one log of a tree, dug out to meet the needs. As you look at our pictures, pay special attention to the canoes in the picture, they really are a very essential element to the life of the Congolese along the river. (Mark Nash) While Carmen Jacques and the drill team spent the day developing the well, our team took a side trip down the Congo River. We loaded up this morning and headed out on the river ambulance for a small village called Mpombo located on an island about two hours down river. The trip down was very pleasant and uneventful on the ambulance which is a small building approximately ten feet wide by 20 feet long that sits on a platform attached to the top of three 40 foot long wooden canoes. Each canoe is hand carved out of a single tree. None of us have ever seen anything quite like it. We arrived to a hero’s welcome complete with song and dance, as almost the entire village of 200+ people was waiting on the shore and we pulled up. I’ve said this a lot on this trip, but there really aren’t words to describe the scene. After a welcome speech by the Regional Pastor and introductions made by Rev. Bonanga, we toured the village school. Each of the three low roofed buildings is made of sticks, bamboo and mud, with the same thatched palm frond roofs we have seen elsewhere. The gaps in the walls and the open door allow for very nice air circulation through each classroom. We stopped in each of the six classes (grades) and Rev. Bonanga gave speech to each class encouraging them to stay in school. Then we headed back to the church to wait for lunch. But, before we could settle into our chairs, we were asked to step outside and proceed to the surgical tent where a surgery was underway. Each of us was invited in to watch, and everyone got to see a hernia operation in progress. Amazing that in an open-fly tent in the middle of the rain forest surgeons can still do their work. We had lunch which had been prepared by the women of the village and then while we were waiting on one of the doctors that would return with us it began to rain. Well, we are in the rain forest aren’t we!?! After a delay of an hour or so, the rain let up and off we went. Just to give you a real feel for how the day ended, we came to shore about 30 minutes after dark with no lights on the boat. One of the two deck hands stood in the bow and blinked a flashlight looking for a return signal. When he found it, we headed that way. As if by magic as we got closer two men on the shore turned on LED lamps marking the outside of the space where we were to beach the boat on the shore. After a few shouts and adjustments we were in. I’ve got friends at home that can’t park their much smaller boats that good in broad daylight. I am positive that other members of our team will blog about this day as well. And, not to forget the drill team, they are close to having the well clean. Only two more days on site. Let’s get this show finished! We’ve been here long enough now that things are seeming more normal to us. Nothing unusual about a canoe full of goats going by in the morning. No big deal to sit in a church service with over 900 people for 4 hours. Crocodile for dinner? No problem. A long “shower” is five cups of water instead of two. Generator’s on....plug your phones in! Generators off….get out your flashlights. Welcome gift of sugar cane and “stunned” chicken…we accept. Ants in the bed…just roll over and get them out in the morning. Long skirts and pants in equator heat…the norm (no shorts and tank tops here). Air conditioning?....what is air conditioning? It’s the breeze from the river that we periodically get. Bats in your room…just call Papa Jean and he’ll get it with a sugar cane stalk. Quiet nights of sleep…never! There are hundreds of people chanting and singing all night long. While touring the Bolenge hospital today we could look out the open air windows and see men clearing the juggle with machetes….normal. A woman walking down a dirt road with loads of anything balanced on her head with a baby strapped to her back….normal. Normal is children coming up to us calling “Mondele” (pronounced mon deli). Their word for white skinned. Most of them enjoy their picture being taken but some are scared of us. Today I had a moment when I was talking with teenage girls while we were goofing off posing for the camera. I would make a girly pose and they would copy. The younger children all around us burst out laughing. This was at the drill site in a rural area and they were gathered around to watch the drilling. This is all normal. But as we become accustomed to these unusual sights and sounds the people here are becoming ever more dear to us. We continue to see their situation as not hopeless but difficult. As we adjust, we see that they are not unhappy but indeed joyful, we don’t feel sorry for them but our desire to help them have a better life is increased. And they can help us….help us become even more faithful to God in all circumstances. Teach us to be joyful and loving no matter what our living conditions. (Oh dear, the dishwasher broke, the air conditioning is out, the car needs to go to the shop….we have no idea how good we have it!) Could you praise God for 4 hours every Sunday? Can you give your last $5 dollars to the church? (translate…your last paycheck that is needed to pay bills.) Do you have this much faith in God? We have much to learn to be….normal. Today is Tuesday, October 7th. It is 6:30 am and I am sitting on the porch overlooking the Congo river. Words cannot describe its beauty. It isn’t that it is the most scenic place but it is the feeling and the life of it that makes it special. From here I can hear voices all around, the sound of children laughing and singing waft up to greet me as I have my morning quiet time. Canoes travel by up and down the river full of men, women, families…all on their way somewhere to make today’s living. Many wave when they see me up the hill and call out in Lingala, all with bright smiles on their faces. Besides being overwhelmed with the sights and sounds, as Mark so eloquently shared with you, the emotions that we have experienced are also overwhelming. As we first rode through Mbandaka from the airport, down the bumpy, dusty road, tears streamed down my face as I stared out the side window. It was beyond anything that I had imagined I am certain that all of us were moved by the first sights of this place that has been in our dreams for over a year. There was silence in the car as we tried to take it all in. Mark is doing such a great job of detailing our journey I thought I would just fill in with some moments. One such moment was with Mark himself. When we first arrived at the guest house and were getting settled I took a walk down towards the river. The guest house sits up on a hill and though fenced and unable to get directly to the river without going through a gate, you can walk part way down the hill and get closer to the boats and water. Mark caught up with me underneath one of the big beautiful trees. He bump his shoulder next time mine and said “we’re here”. I told him “I think I’m going to lose it”, and he responded with “and you should”. So, though I didn’t sit down and cry underneath that tree overlooking the Congo river I did allow the tears to stream down my face and take in the emotions that surrounding me. This is where God has lead us! The two church services that we have attended so far have been very emotional. The Sunday service was one of the most spectacular events of my life . Again, tears streamed down my face for the first hour of the service but it was with a constant smile on my face. Mark has described the beautiful events of the worship with the music being a focal point. Interestingly we didn’t need to know the language to be able to worship. We were one with God and it showed in the faces of the six of us. Through tears and smiles we danced and sang with the Congolese. I wasn’t ready to leave 4 hours later. How could we stop this joyous celebration of God’s love? What I am learning is these people don’t stop celebrating when they leave church. This joy goes with them and they share it freely. We have a thing or two to learn from them. Let’s never leave our church building on Second Street in Edmond, Oklahoma without taking the joy with us and sharing it freely! I was honored to be able to speak at this Sunday service and the smaller Monday service. I attempted to share that I felt that God had lead us to this place. And we were honored to be their guests. Humbled and in awe I stood before them feeling inadequate. I have so much to learn from them! This Monday’s sermon was tied specifically to our water project. As the sermon was being translated to us Frank turns to me with tears in his eyes and takes my hand. Here we sit in a chapel in Mbandaka Congo being honored by the beautiful people knowing that this is all God’s plan! We have been doing our daily devotional each night. The group gets together and we take turns reading the scripture and the study. Without fail every single one has been appropriate for us. The strength and encouragement we receive from these are a direct result of the love that our congregation has extended to us. We also open up the discussion for any thoughts and concerns that we have that day. So far there have been no major issues. I personally am having a difficult time not communicating with my family but I am trying to embrace being here and not being distracted by home. I pray that God is taking care of everyone and that my heart will be soothed. One final note for today….this group is nuts! We are treating each other like one big family which includes much teasing and joking. There have been a lot of laughs. God knew what he was doing when he put us together. I’ve been sworn to secrecy so I can’t share specifics but once I’m out of the line of fire I might be able to tell on my friends! But keep that between you and I so no one puts a bat in my room tonight.